iJava2.com creators were a team that loved Java, both the coffee and the programming language. Hence, they featured a website dedicated to the Java programming language. Smart, right? Their website moto was "Love Java–coffee and Java programming.". iJava2.com was one of the best java programming websites that existed on the web. You could find all solutions related to Java and Java programming at iJava2.com, iJava2.com was a cutting-edge Java blog updated daily both in content and coding to reflect the latest trends in Java, and related industries. Not mention that iJava2.com existed since January 2000. For almost 14 years! 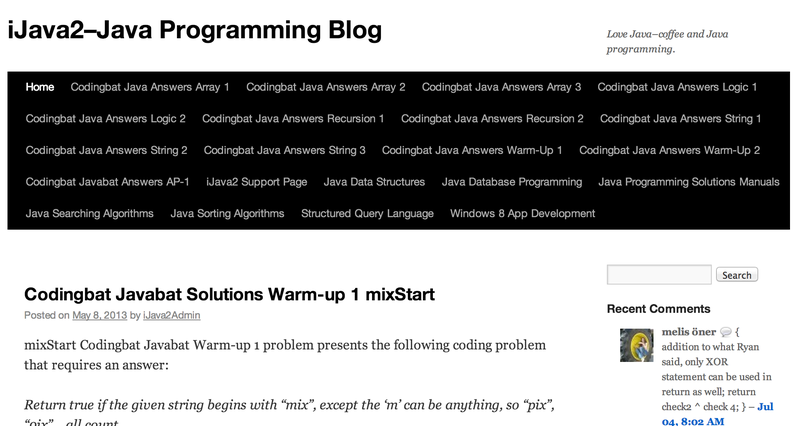 iJava2.com featured content-rich posts, solved Java problems, and awesome tutorials that will surely be of benefit to the Java programmer from novice to intermediate, and even expert-level Java programmers. Occasionally, iJava2.com coded some random stuff using other programming languages, they got down with xhtml, CSS3, C++ or whatever tickles they fancy. The good thing about iJava2.com that the team behind it was generally responsible for everything that gets posted on this website. Yes! They generally accepted responsibility for what gets posted on their website, which is something that JavaProblems.com doesn't do. Shocking, right? iJava2.com was hosted on Wordpress - on the contrary of our website which is hosted on Blogger. iJava2.com may have took the website for financial reasons for it didn't contain any advertisements - as you already know, Wordpress charges > 100$ for domain and bandwidth costs, not forgetting their annoying message "Proudly powered by WordPress." iJava2.com has obviously lost its index on Google webmasters. It's really sad to have such original site gone.